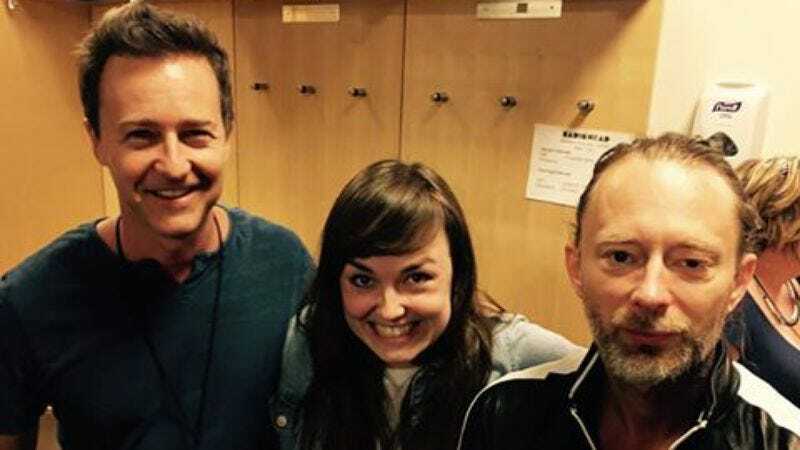 Last week, we reported on a contest being held by actor and conservation advocate Edward Norton, in which a lucky Radiohead fan could win a chance to hang out with him at one of the band’s concerts, trading awkward small talk and catching occasional whiffs of his powerful Norton musk. Well on Tuesday night, that dream came true for fan and Cartoon Network artist Julia Srednicki, after her donation to Conservation International and Kenya’s Maasai Wilderness Conservations Trust earned her two tickets and a Norton-assisted tour of the show. Besides getting personal answers to all her hottest Fight Club questions, Srednicki’s contest package also included a chance to go backstage and meet Radiohead’s Jonny Greenwood and singer-songwriter Thom Yorke. She looks thrilled to be there, too, as does her partner, and Greenwood, and Norton. In fact, the only person who looks less than jazzed for these basic human interactions is Yorke, who seems to have set his face to the default “meeting a contest winner” expression and then been unable to adjust it from there. Yorke’s stoic expression doesn’t seem to have even slightly diminished Srednicki’s delight at meeting him and Greenwood, who apparently asked her and her partner to show off their cartooning skills. For those of you compiling a database of all the modern cartoons Thom Yorke knows about—shout-out to the multimedia grad student working on “In Rainbows Dash: The Radiohead-Friendship Is Magic Connection”—Adventure Time’s not on the list, although his daughter Agnes is apparently a big fan.